A couple of weeks ago I happened to be in the right spot to view the retiring space shuttle on it’s 747 piggyback parade circuit around the Bay Area. I had been watching Star Trek NG all week and was pumped up with the glory of human potential anyway, but when I realized the people standing around me on the lawn had actually worked on components on that shuttle; bits of shield or wiring or material development, I got a lump in my throat. People I didn’t know were crying, holding up phones and ipads to photograph the leisurely fly by. 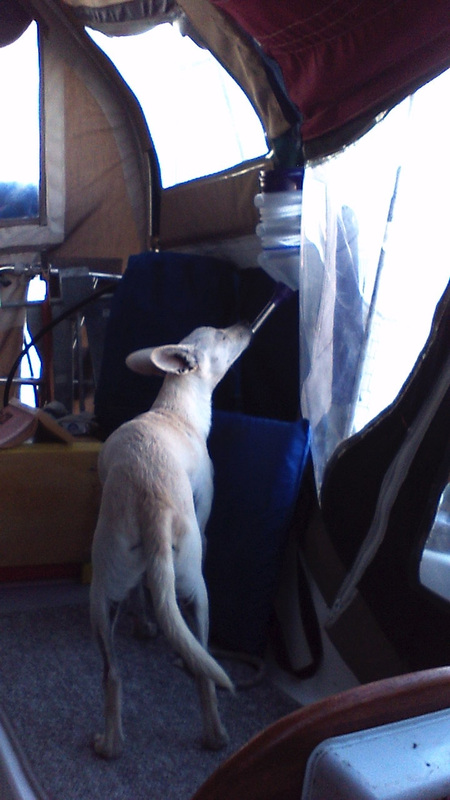 Speaking of dingos, my little white furry friend achieved new heights by learning how to drink out of his very own water bottle strapped to the cockpit. It is always clean, doesn’t spill, and always available when he wants it. Plus he looks like a nursing lamb when he’s drinking. This entry was posted on Saturday, October 13th, 2012 at 2:51 pm and is filed under Uncategorized. You can feed this entry. You can leave a response, or trackback from your own site. « Dock Dorks is At The Printer!